A multitude of bird species make Sparta Mountain WMA their home—in fact, 107 species have been documented, and 64 of them have been documented at sites that have been managed for young forests. 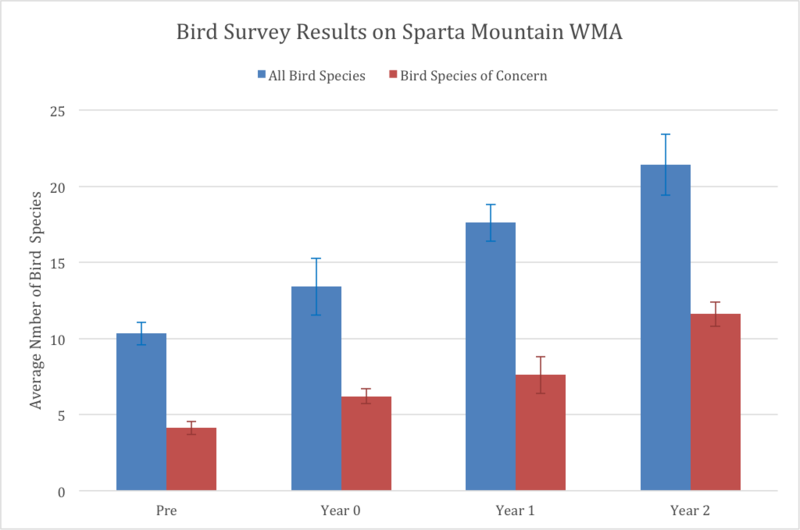 Based on bird surveys conducted over multiple years at Sparta Mountain WMA, the number of species of birds increased by about 3.5 species per year starting at the baseline before the treatment; about two of those 3.5 species per year are of conservation concern. Pre-treatment bird surveys on Sparta Mountain WMA were conducted in 2004 and/or 2008. Post-treatment bird surveys were conducted from 2012 through 2016. In 2016, DEP biologists recorded 34 different bird species at a single management site that was cut just four years prior. Some of the more notable species documented there include the eastern whip-poor-will, least flycatcher, and red-shouldered hawk. It was no surprise to find such diversity as the birds rely on the young forest for breeding, nesting, feeding, or as a migratory rest stop. Common species found include eastern towhees, prairie warblers, red-eyed vireos, veeries, and Baltimore orioles. The endangered golden-winged warbler has yet to be found but it prefers young forests 5-15 years old. We anticipate seeing the golden-winged warbler nesting in this area within the next two years. Recorded on June 13, 2016 at 4:42 a.m. four years after we performed a Seed Tree Harvest with Wildlife Reserves on this 13.5 acre parcel. Bird surveys were conducted on Sparta Mountain WMA in Spring 2004 and Spring 2008 as a baseline for the Sparta Mountain WMA forest stewardship plan (2009). Stands where management was completed had an average 10.3 species of birds breeding on it (range 6-17); less than half of which are bird species of conservation concern (average 4.1). The most common species observed (>70% of survey locations) include the ovenbird, scarlet tanager, eastern tufted titmouse, and red-eyed vireo. Less common but still present (>40% of survey points) are the brown-headed cowbird, eastern wood-pewee, great crested flycatcher, black-capped chickadee, blue jay, veery, and yellow-billed cuckoo. Within a few months, just as the vegetation began to grow, an average 12.3 species of birds breed on the managed sites (range 7-18), about half of which are species of conservation concern (average 6.2). The ovenbird, American redstart, scarlet tanager, eastern wood-pewee, brown-headed cowbird, great crested flycatcher, and veery are still common and eastern bluebirds have now moved in. New arrivals of conservation concern include the prairie warbler, eastern towhee, and Baltimore oriole. Two years after the harvest, trees and shrubs are four feet tall and are shade intolerant species, an average 21.4 species of birds breed on the managed sites (range 16-28), more than half of which are species of conservation concern (average 11.6). The most common bird species are now the prairie warbler, eastern towhee, gray catbird, Baltimore oriole, scarlet tanager, blue-winged warbler, cedar waxing, field sparrow, indigo bunting, rose-breasted grosbeak, red-bellied woodpecker, chestnut-sided warbler, and chipping sparrow. Still present are the eastern wood-pewee, red-eyed vireo, veery, brown-headed cowbird, eastern bluebird, American redstart, eastern tufted titmouse, yellow-billed cuckoo, and black-capped chickadee, but the prairie warbler, eastern towhee, Baltimore oriole, and scarlet tanager are now more abundant. New arrivals of conservation concern include the blue-winged warbler, field sparrow, indigo bunting, rose-breasted grosbeak, gray catbird, eastern kingbird, and black-and-white warbler.